This title is directed primarily towards health care professionals outside of the United States. An understanding of medicines and their effects on patients remains a crucial area of nursing knowledge. 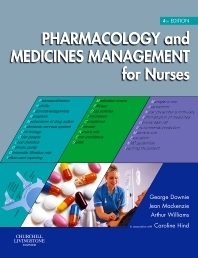 This book provides a thorough foundation upon which nurses can build their clinical experience to achieve competence. It not only provides information on the actions of drugs on the body but also gives clear guidance on the practical aspects of medicines management in both hospital and community. Organisation of the text broadly follows the British National Formulary for ease of use.